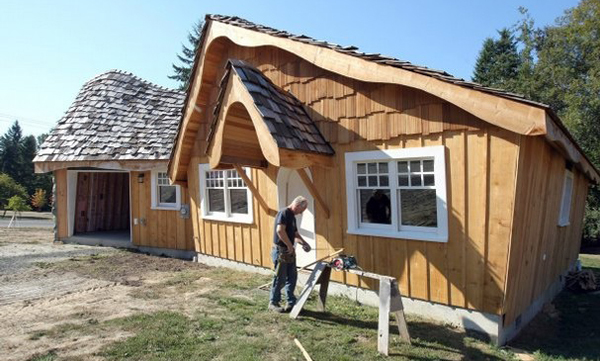 Islander Chris Whited didn’t set out to build a “hobbit house” when he started his eccentric building project on High School Road. The comparisons, however, proved unavoidable. His neighbors were the first to invoke the Middle-earth reference, inspired by the cottage’s slanted walls and curved roofline. When we featured Whited’s creation on the cover of the Sun in October, the word “hobbit” landed the story on the AP wire. It went modestly viral from there, popping up in various forms on news sites across the country. Whited wasn’t prepared for the response. Despite his newfound notoriety, Whited wasn’t queuing up for the “Hobbit” premier Thursday. “Midnight just doesn’t sound like fun to me,” he told Sun reporter Rachel Pritchett. 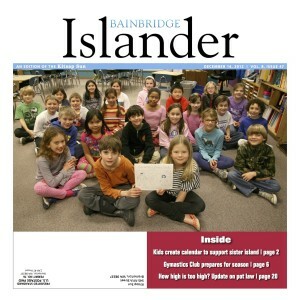 Here’s the Friday preview: Bainbridge edition for Dec. 14. Feel free to give your events a plug in the comment section below. Above, a detail from the 2013 Kids Can Make a Difference calendar, illustrated by Ordway Elementary third graders. The calendars, which benefit programs on Ometepe, are available at Ordway through Dec. 21. Weather: The National Weather Service predicts rain showers and temperatures in the low 40s this weekend. Expect a little wind as well, with gusts up to 25 mph. Sports: Another full slate of winter sports today. Wrestling is away at the Hammerhead Invitational in Silverdale. Bainbridge gymnastics welcomes Bellingham, Mercer Island, Squalicum and Sehome at 6 p.m.
Spartans basketball hosts Franklin. Girls varsity tips off at 6:15, followed by the boys at 8 p.m. A home swim meet was postponed.